"I'll just tell people I returned it. They won't notice 4 years later that I'm still wearing it." HopeForAmerica made a startling revelation on Politicalgates Tuesday - Sarah Palin never returned the clothes the Republican National Committee bought her four years ago - you know, that $150,000 credit card charge the McCain campaign regretted. 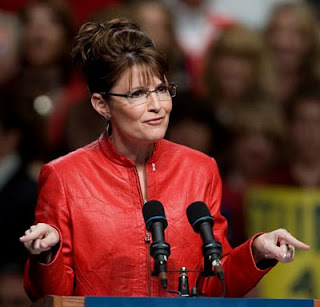 Yesterday on Sean Hannity, Sarah Palin popped up in her bright red leather jacket. Guess it is easier to say you have done something then to actually have done it. Palin talks about what a great person she is but in the end we all know what she is. If you like conspiracies, this could be evidence of Fox News acting in concert with the RNC, after all, the clothes were said to have been sitting in the RNC headquarters and Palin happens to be a paid Fox News contributor. Maybe RNC is acting as wardrobe for the former half-term governor/failed vice-presidential candidate. I will have to say that Palin is quite the idiot for sticking a pin (see lapel) through her expensive leather jacket, but why should she care? She didn't pay for it. do they really want them back?